This is the audio companion set to the new BluRay I reviewed in this very issue of Music Street Journal. See that one for more about the full set and video involved, and so forth. 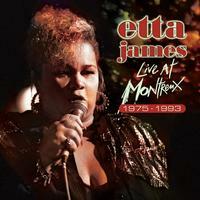 Here we’ve got a killer blues and R & B set that shows just how powerful a performer Etta James was. She passed away earlier this year, and this demonstrates that it truly was a loss. Coming from the 1993 performance, this is a high energy jam of a track made famous in the rock world by Foghat. The arrangement has great horns and keys, bridging a gap between R & B, blues and rock. It’s a real screamer. This is a slower, retro styled blues number that’s just plain cool. It’s definitely not as high energy and powerful in terms of music as the opener, but James’ vocals really get to shine more here. This is another from the 1993 appearance. There’s a nice horn section appearance late in the piece. This is certainly a lot more traditional in scope and style. Also from that same performance, there’s some serious funk and jazz built into this rocking number. I really like James’ singing on this number a lot. While this is a pretty standard progression, we get some smoking hot instrumental performances here. The arrangement on this one is very stripped down and yet it’s not a real traditional sound. Again, James’ vocal performance is the real star here. This is sort of a balladic cut and has some tasty guitar soloing. This is also from that 1993 show. Retro sounding and mid-tempoed, this cut (also from ’93) is soulful and tasty. It’s very bluesy and rather understated. It’s also great. It powers up later and we get some classy keyboard work, great horn section and killer guitar soloing. The first of three songs from James’ 1975 performance, there’s a great R&B meets blues quality to this tune and it’s got a lot of character. James and company all put in quite inspiring showings on this tune, but it might be James’ best vocal performance of the whole set. This thing is just on fire. This number is a long one and includes some real jazzy sections, particularly the closing instrumental section. This is a jazzy number that isn’t as energized as the last one (it’s from the same show). It’s got a lot of cool in it and reminds me a bit of “Come to Mama.” The horn section is a bit unusual (I think that’s a tuba in there). This is OK, but one of the more lackluster tunes. The final cut from the 1975 show, this one is good, but not really exceptional at all. It’s a pretty standard tune, but James still shines. Recorded in 1977, this number is a jazzy kind of torch medley that’s quite tasty. It’s a bit of a change and works pretty well. From 1989. this a slow jazzy number that’s very tasty.